The trailer for Final Score has arrived from Sky Cinema, and it looks like a big mashup between Speed and Taken. There's a bomb in a stadium and only Dave Bautista can save the day. But he has to save his 13-year-old god daughter first. 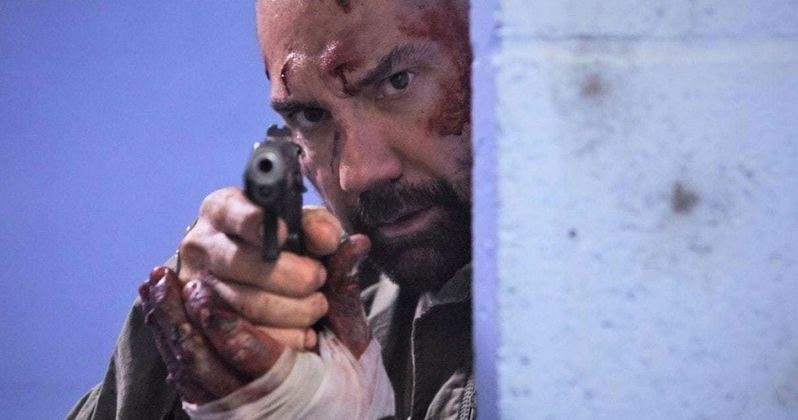 Dave Bautista hasn't quite made a name for himself as an action star. He's better known for his role as Drax the Destroyer in the Guardians of the Galaxy movies. Here, he doesn't have to wear green make-up. Instead, he is playing an everyman in a ball cap trying to enjoy the game. But some terrorists are making that simply impossible. Michael Knox (Bautista) is an ex-soldier who must use all his military skills to save the 35,000 capacity crowd at a major sporting event, one of which is the daughter of his fallen comrade, when the stadium is suddenly seized by a group of heavily armed criminals demanding ransom. Final Score was directed by Scott Mann. He is best known for his 2015 action thriller Heist, which starred the stellar line-up of Robert De Niro, Jeffrey Dean Morgan, Kate Bosworth, Morris Chestnut, and Dave Bautista. He also directed 2009's The Tournament, a small British film that caught a lot of people's attention. Final Score was written by David T. Lynch and Keith Lynch. The pair previously worked with Scott Mann on his film Heist. Rounding out the cast here is Ray Stevenson, Julian Cheung, Russell Phillips, Alexandra Dinu and Pierce Brosnan. The action thriller first sprang to life in February 2016, and it was sold to investors as Die Hard in a football stadium. The production was shot at the Boleyn Ground, former home of West Ham United. Everything wrapped in late 2016, so the film has been in post-production for almost two years. Bautista said this about the movie. ""Final Score was tons of fun. Think, Die Hard-in-a-[soccer]-stadium. It feels like an old '80s, early '90s action film - and intentionally. We wanted it to be stylistically that way and have that type of feel to it. It's not the exact same premise [as Die Hard], but it is very similar." Final Score is set to hit UK and Ireland screens on September 7. In the states, movie will be released in theaters, on VOD, and via Digital HD, Sept. 14.. It looks exciting enough to warrant a watch, and it just might turn Dave Bautista into a bonafide action star yet. 35,000 lives. 90 minutes. No extra time. That's the tag line for Final Score, and if that doesn't get your blood racing and your fists pumping, you're just a loser who doesn't like action movies with high concept ideas, I guess. But that's just my humble opinion. Because this actually looks pretty awesome. Sky Cinema brings us the first trailer, which you can enjoy here.